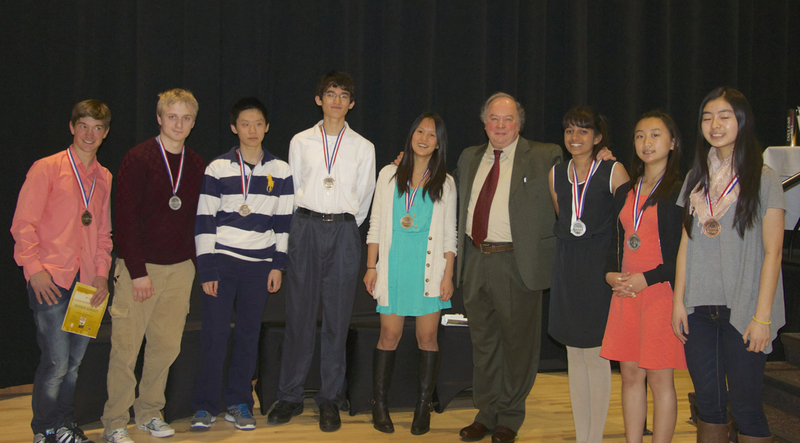 Alexander Soifer, Colorado Math Olympiad chair and professor, Interdepartmental Studies, poses with this year’s winners (from left to right): Rodion Kosmin, William Shand, Hongyi Chen, Avi Swartz, Sarah Gao, Anjalie Kini, Andrea Lin, and Amy Wang. COLORADO SPRINGS, Colo. – For the first time in the thirty-two year history of the Colorado Mathematical Olympiad at the University of Colorado Colorado Springs, a middle school girl earned first prize in the competition. Sara Gao, grade 8, from Campus Middle School in Englewood was one of four first prize winners of the April 24 competition that brought 328 middle and high school students from throughout Colorado and from an Alabama school to UCCS. She became the first female to earn first prize. Award winners were announced at a May 1 ceremony. Rodion Kosmin, grade 12, Castle View High School, Castle Rock. Kosmin is visiting from Ukraine. First prize winners will receive a gold medal, a $500 scholarship to attend any accredited U.S. university, a UCCS Chancellor’s Scholarship, “The Scholar and the State: In Search of Van der Waerden” by Alexander Soifer, a Casio graphing calculator, and a Wolfram Research software Mathematica. Students from Colorado cities of Aurora, Boulder, Broomfield, Castle Rock, Centennial, Colorado Springs, Denver, Englewood, Greeley, Greenwood Village, Highlands Ranch, Littleton, Lone Tree, Longmont, Monument, Parachute, Superior, and Rangely participated. The competition also drew contestants from Alabama School of Mathematics and Sciences, Mobile, Ala. The students were offered five problems and four hours to solve them and present complete essay-type solutions. Second prize winners will receive a silver medal, a $1,000 UCCS Chancellor’s Scholarship, “The Colorado Mathematical Olympiad: From the Mountains of Colorado to the Peaks of Mathematics” by Alexander Soifer, a Casio graphing calculator, and a Wolfram Research software Mathematica. She will receive a bronze medal, a $1,000 UCCS Chancellor’s Scholarship; a book from Springer Academic Publishing, a Casio graphing calculator, and a Wolfram Research software Mathematica. She received a puzzle invented by Erno Rubik, the book “A New Kind of Science,” by Stephen Wolfram, a Casio graphing calculator and Wolfram Research software Mathematica. Mathew Kang, grade 11, Alabama School of Math and Science, Mobile, Ala.
Noah Poirson, grade 12, Alabama School of Math and Science, Mobile, Ala. Honorable mention students will receive the book “A New Kind of Science,” by Stephen Wolfram, a Casio graphing calculator and Wolfram Research software Mathematica. The University of Colorado Colorado Springs, located on Austin Bluffs Parkway in Colorado Springs, is one of the fastest growing universities in Colorado. The University offers 37 bachelor’s degrees, 20 master’s and five doctoral degrees. UCCS enrolls about 11,000 students on campus annually and another 2,000 in online programs. For more information, visit www.uccs.edu.